Perspiration turned to celebration for East Fife at the end of a tense stalemate at Broadwood with the point gained enough to confirm Gary Naysmith’s men as League Two Champions. It may not have been confirmed with great elan as results elsewhere went their way, but nothing can take away from the terrific consistency which the Methil club have shown in the run-in, with just one defeat in their past 16 games – the sort of mettle any side aspiring to top the table has to demonstrate. Nathan Austin celebrates with brother Jordan following East Fife's title win. Securing promotion for the Fifers for the first time in eight seasons represents no small achievement on the part of Naysmith, who has been patient and persistent in piecing together a cohesive and free scoring side since taking over at Bayview nearly two and a half years ago. The former Hearts, Everton and Scotland full-back could barely conceal his delight at his men getting the job done yesterday. Naysmith added: “As a management team we contribute 5-10 per cent – the players have been outstanding. Over this run we’ve been on there’s probably only been about 12 or 13 players who have started, but it’s the ones that haven’t started that have done it as well. They’ve come in and trained two nights a week, their work rate’s been fantastic and they’ve pushed the other guys on. It’s been a total squad game”. Asked how it compared to winning the Scottish Cup and international caps as a player, Naysmith was no less effusive. He said: “It’s been one of the longest weeks of my life, just waiting for the match to come round. I wasn’t worried about the game itself because we’ve been on such a great run of form and confidence comes from that. “It’s a very special moment in my career – I didn’t think anything would beat getting capped for my country, but it actually does because you’re in charge of a group of players and you’re the one they look up to as a leader. It makes me proud and I’m proud of what the team have achieved”. While the result and promotion will live long in the memory of Naysmith, his squad and all connected with the Fifers, it’s not being too harsh to say that the actual content of the 90 minutes will probably be fairly quickly erased. 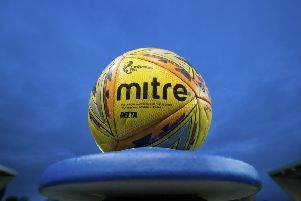 Clyde also had plenty to play for as they sought to maintain their own promotion hopes via the play-off places and both sides bristled with a nervous energy throughout. To say that chances were at a premium would be overstating the number of genuinely threatening moments for either goalkeeper. In the first half, a dipping 35-yard free kick from Scott McLaughlin that just ended up having too much elevation was the best moment for the hosts whilst it took a last-ditch clearance by Sean Higgins to prevent a looping shot from Nathan Austin giving the Fifers the lead. If anything, the frantic pace cranked up even more after the interval but again neither side really conjured up much of consequence. There was some brave defending on view and two efforts from the Fifers’ Stevie Campbell came close to providing them with a victory that would have been the icing on the promotion-winning cake. In truth though, a draw was a fair outcome.